Dremel have done it again - delighted us with yet another little ace product that I have found useful for so many things around the home and for my hobbies and craft projects. The Dremel VersaTip. 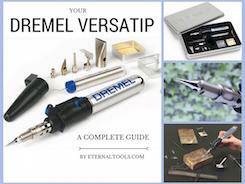 This article is a review and guide to the Dremel VersaTip 2000-6 kit, an all in one gas torch, soldering iron, pyrography pen and more, that comes with 6 attachments tips.